A stunning literary thriller in the tradition of Umberto Eco. The discovery of a forgotten book leads to a hunt for an elusive author who may or may not still be alive...Hidden in the heart of the old city of Barcelona is the 'cemetery of lost books', a labyrinthine library of obscure and forgotten titles that have long gone out of print. To this library, a man brings his 10-year-old son Daniel one cold morning in 1945. Daniel is allowed to choose one book from the shelves and pulls out 'La Sombra del Viento' by Julian Carax. But as he grows up, several people seem inordinately interested in his find. Then, one night, as he is wandering the old streets once more, Daniel is approached by a figure who reminds him of a character from La Sombra del Viento, a character who turns out to be the devil. This man is tracking down every last copy of Carax's work in order to burn them. What begins as a case of literary curiosity turns into a race to find out the truth behind the life and death of Julian Carax and to save those he left behind. A page-turning exploration of obsession in literature and love, and the places that obsession can lead. Hidden in the heart of the old city of Barcelona is the 'cemetery of lost books', a labyrinthine library of obscure and forgotten titles that have long gone out of print. To this library, a man brings his 10-year-old son Daniel one cold morning in 1945. Daniel is allowed to choose one book from the shelves and pulls out 'La Sombra Del Viento' by Julian Carax. But as he grows up, several people seem inordinately interested in his find. Then, one night, as he is wandering the old streets once more, Daniel is approached by a figure who reminds him of a character from La Sombra del Viento, a character who turns out to be the devil. This man is tracking down every last copy of Carax's works in order to burn them. What begins as a case of literary curiosity turns into a race to find out the truth behind the life and death of Julian Carax and to save those he left behind. A page-turning exploration of obsession in literature and love, and the places that obsession can lead. Barcelona, 1945 just after the war, a great world city lies in shadow, nursing its wounds, and a boy named Daniel awakes on his eleventh birthday to find that he can no longer remember his mother s face. To console his only child, Daniel s widowed father, an antiquarian book dealer, initiates him into the secret of the Cemetery of Forgotten Books, a library tended by Barcelona s guild of rare-book dealers as a repository for books forgotten by the world, waiting for someone who will care about them again. Daniel s father coaxes him to choose a volume from the spiraling labyrinth of shelves, one that, it is said, will have a special meaning for him. And Daniel so loves the novel he selects, The Shadow of the Wind by one Julian Carax, that he sets out to find the rest of Carax s work. To his shock, he discovers that someone has been systematically destroying every copy of every book this author has written. In fact, he may have the last one in existence. Before Daniel knows it his seemingly innocent quest has opened a door into one of Barcelona s darkest secrets, an epic story of murder, magic, madness and doomed love. And before long he realizes that if he doesn t find out the truth about Julian Carax, he and those closest to him will suffer horribly.As with all astounding novels, The Shadow of the Wind sends the mind groping for comparisons T he Crimson Petal and the White ? The novels of Arturo Perez-Reverte? Of Victor Hugo? Love in the Time of Cholera ? but in the end, as with all astounding novels, no comparison can suffice. As one leading Spanish reviewer wrote, The originality of Ruiz Zafon s voice is bombproof and displays a diabolical talent. The Shadow of the Wind announces a phenomenon in Spanish literature. An uncannily absorbing historical mystery, a heart-piercing romance, and a moving homage to the mystical power of books, The Shadow of the Wind is a triumph of the storyteller s art. 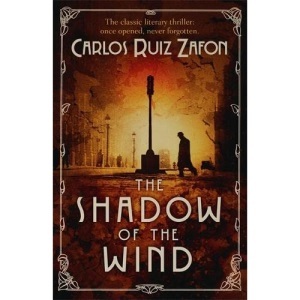 Carlos Ruiz Zafon is the author of eight novels, including the international phenomenon The Shadow of the Wind, and The Angel's Game. His work has been published in more than forty-five different languages, has sold over thirty million copies, and has been honoured with numerous international awards. He lives in Los Angeles, California.